Creating more transit-oriented communities is one of the key goals of most land use and transportation plans in Metro Vancouver. In practice, this means concentrating higher-density, mixed-use, human-scale development around frequent transit stops and stations, in combination with mobility management measures to discourage unnecessary driving. Derrick Cheung is TransLink’s vice-president of strategic sourcing and real estate, and his team is responsible for introducing and providing executive oversight for the Adjacent and Integrated Development (AID) Program. AID facilitates the numerous transit-oriented developments that can be seen near TransLink’s owned and managed transportation infrastructure across Metro Vancouver. In 2012, TransLink, in partnership with the City of Richmond, completed Canada’s first 100 per cent privately funded rapid transit station agreement on the Canada Line, realized in Capstan Station. “By seeking innovative and alternative methods of financing transportation, we are able to invest in other regional priorities,” Cheung says. Since 2011, development near transit has grown exponentially. There are currently 36 development projects in construction or planning stages. This amounts to approximately $14 billion of construction activity. They include projects such as the redevelopment of Oakridge Centre and Brentwood Town Centre. In addition, there are up to 25 new projects in the pipeline. The world is taking notice. On the financial side, TransLink works with developers to provide access inside of the public right of way, but for a price. Metro Vancouver has long supported a transit-oriented land use approach, with the 1975 Livable Region Plan envisioning a transit-oriented regional community of compact urban centres linked by frequent transit corridors. This approach was reafﬁrmed in the 1996 Livable Region Strategic Plan and continues to be a key direction in the new Regional Growth Strategy adopted in 2011. TransLink and its internationally admired network and approach to transit-oriented development is central to managing the rapid population growth of the region, he adds. 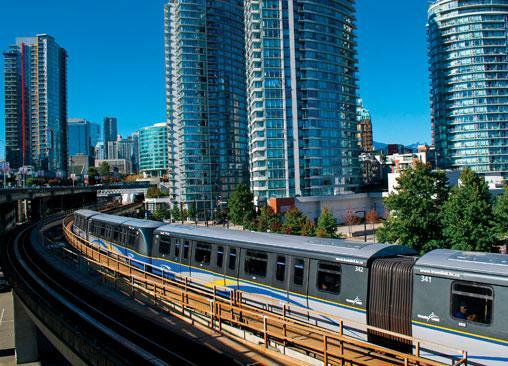 “A Metro Vancouver without lively, transit-orientated urban centres along highly efficient transportation corridors, would be a dreary place to live indeed,” says Andrew Curran, manager of policy and development for TransLink. The municipal planning support and AID programs facilitate a sustainable way to accommodate the city’s growth, and preserve the high quality of life those living in Metro Vancouver enjoy.